I tried. I really did. 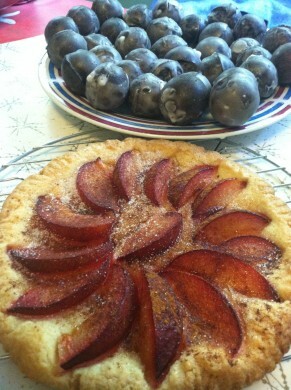 But the plum tarts I made just didn’t taste like my mom’s. They were good, though. I was happy with the results and the fact that one sold pretty quickly at our tailgate market. Then a nice German grandma came up to our booth and asked her husband who was following quietly behind if he wanted “one of those plum tarts”. That made me nervous. I wasn’t sure my cakes were up to par, especially since I just threw the dough together without a recipe, jotting everything down in case they ended up edible. Then she told me that she makes her own. Yikes! We discussed which type of dough she uses to make hers. She chooses the yeast cake method. I told her mine were the shortcrust versions that my mother always made. When she asked me to hold one for her while they looked around I promised to, but since people always say they will come right back and never do I figured I’d go home with two plum tarts. Nope. The nice little couple came back and bought the one I’d held, just a few minutes after another customer had snatched up number three. Dang it! None to take home. I was getting hopeful there at the end. At least we’d had the chance to sample the one that never made it to the market. 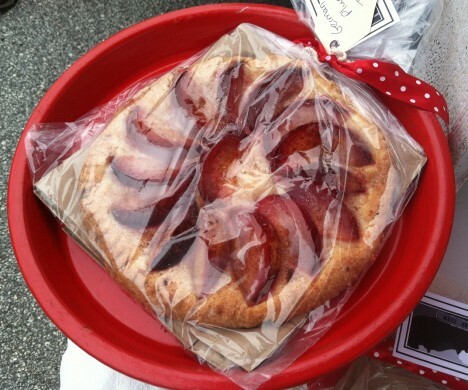 Here is my recipe for my mother’s style of German plum cake. It’s not hers, just my version. I really wish you could taste hers. Don’t know what the heck it is that I’ve been doing differently all these years. I would have added almond extract but was all out. I’m pretty sure hers has almond extract. Oh well. Maybe she’ll read this post and email me to straighten me out. I wonder what the little German couple thought. That’s going to drive me nuts. Sift together the sugar, salt, and flour. Work in the butter until the mixture is crumbly. Add the egg and vanilla. Gently work the dough while adding a little water at a time just until it forms a ball of dough. Don’t overwork it or it will be tough when it’s baked. Roll on a floured surface into desired shape. I made two rounds and two squares, then placed them on sheet pans. Usually, though, I would press the dough into a tart pan with a removable circular bottom. This batch of dough would probably have filled two of those. Slice the plums into wedges and arrange them in a circular pattern on the surface of the dough, pressing them lightly into it. Sprinkle with sugar and then lightly with cinnamon. Yummy! Looks delicious. I like the idea of small ones instead of one big one. More to share with others, or in your case to sell. I know you can use other fruit too, apples, blueberries, cherries, etc.